I would like to relay a few highlights from my recent trip to China. Our alumni are thriving there, and we have sought to deepen ties by offering an LL.M. 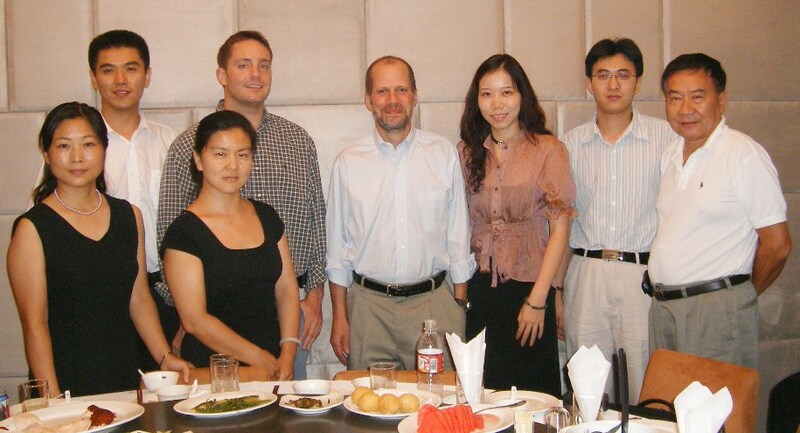 program in Shanghai, Beijing and Guangzhou, in which we teach half of the program overseas and half in Chicago. The Chinese government has encouraged legal training and hopes to prepare a new class of entrepreneurial attorneys to interact with the West. To that end, we have partnered with the Shanghai Bar Association and Beijing Lawyers Association, among others, to facilitate intensive teaching by our faculty in the respective cities. Our faculty present courses three hours a day over a two-week period in which the attorneys acclimate themselves to legal English, the common law system, and the Socratic Method. Demand is greatest for courses in the intellectual property and business transaction fields, though there is growing interest in real estate and financial services as well. We structured the programs to focus on practicing attorneys who would not otherwise be able to afford a full year away from their practices and families. We welcome these attorneys into our LL.M. program each fall for one semester. As a result, we have a growing number of LL.M. alumni in Beijing and Shanghai in particular. Our graduates occupy increasingly prominent positions in law firms and industry. Through those alumni, we offer summer internships to four to six students each summer, and this year placed a JD graduate with one of their firms full time. As our trade with China flourishes, our alumni may play a pivotal role in cementing the relationship between the two nations. One JD alumnus, Carson Block ’05, exemplifies the role of bridge-builder. 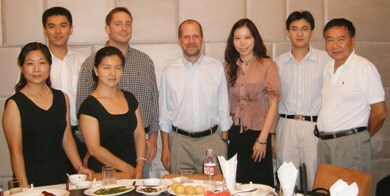 A Mandarin speaker, Carson chose to work for Jones, Day in Shanghai after graduation. He recently left the firm to pioneer a wealth management practice in East Asia. He has also just co-authored Doing Business in China for Dummies (available at bookstores now! ), which explores China's business legal environment, reflects on how to build business relationships, and suggests ways to avoid common pitfalls. Our close relationships with bar associations in China and our increasing number of successful alumni should position us well for the near future as China’s ascendance in the world order continues. I wish you a wonderful end to the summer, and hope to see you at an alumni event in the near future. Theresa M. Williams, a first-year student at Chicago-Kent College of Law, will receive the first SmithAmundsen Excellence in Legal Writing Award. The writing award is part of a $50,000 gift from Smith Amundsen LLC to Chicago-Kent to support the law school’s diversity initiatives over the next five years. The award will be given annually to a first-year student, selected by Chicago-Kent’s legal writing faculty and law firm representatives, who has written the best brief and who “adds to the diversity of the legal community.” Theresa Williams’ winning appellate brief, Ellen Becker v. United States of America, addressed Fourth Amendment search and seizure issues. The gift to Chicago-Kent that funds this award evolved from SmithAmundsen’s Diversity Task Force, a group of representatives from all areas of the firm charged with upholding and advancing firm-wide diversity initiatives. In addition to funding the writing award, the firm’s gift will support the team that represents Chicago-Kent at the Thurgood Marshall National Mock Trial Competition, sponsored by the National Black Law Students Association. SmithAmundsen LLC is celebrating its 10th anniversary this year. For more information on the firm, please visit www.salawus.com. Chicago-Kent College of Law invites alumni specializing in Intellectual Property Law to join the IP Alumni Network. 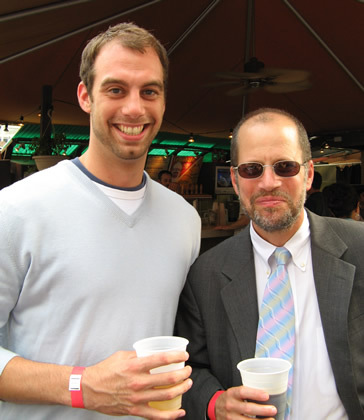 This network was designed to facilitate interactions among IP alumni, Chicago-Kent faculty, and students. As a part of the network, you will have the opportunity to participate in lectures, social gatherings, and networking events, such as ourannual IP Alumni Reception. To join the network, please click here and fill out the form provided. The information on this form will be used by the Office of Alumni Relations and the Intellectual Property Program. You may choose whether or not you would like your information to be visible to other alumni in the network. Additionally, as some of the first alumni involved, you will have the opportunity to shape this network. If you are interested in taking a leadership position within the network, please check appropriate box. Chicago-Kent’s Small Business Program is a new clinical program that offers a comprehensive range of services to small business owners and emerging entrepreneurs in metropolitan Chicago. Law students, working under the direction of business attorney and Professor, Jeff Thomas, will represent small and emerging businesses and entrepreneurs in transactional matters. The program assists small business owners in not only identifying their law-related opportunities and risks, but also provides entity formation assistance and live “mini-sessions” designed to teach small business owners about key legal information. For more information about the Small Business Program, please visit www.jdeas.com. Over 220 Alumni, along with their friends and family, joined us for our annual baseball outing. 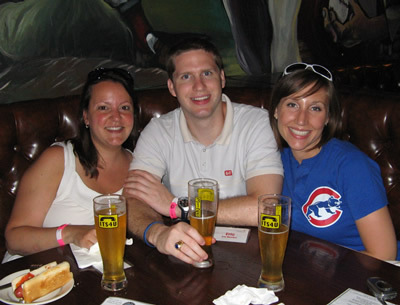 Guests dined at a pre-game reception at Goose Island Brewery in Wrigleyville. Later, Chicago-Kent Alumni cheered as the Cubs beat the Phillies to climb into first place of the National League Central division. For more photos from the event, please visit the Alumni Online Community. 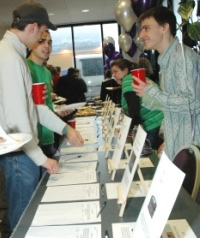 The Kent Justice Foundation (KJF) is the public interest student organization at the Chicago-Kent College of Law. KJF is dedicated to promoting public interest law, supporting volunteerism, and emphasizing pro bono work. KJF’s main program is its Summer Fellowship Program, which awards fellowships to aid students who are committed to taking unpaid/low-paying summer public interest jobs. This year KJF was pleased to award thirteen fellowships for the summer of 2007. Students are working in government and non-profit organizations including the Illinois Pollution Control Board, the Illinois Human Rights Commission, the Illinois State's Attorney’s Office, Juvenile Division, and the US Equal Employment Opportunity Commission. 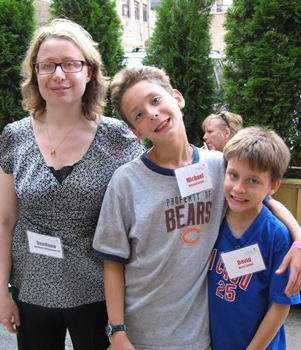 In 2007, KJF raised nearly $30,000—a record setting amount—to support these fellowships. Funds came from various small KJF events, with the largest part deriving from its Spring Auction. Auction prizes included a week at a vacation home in St. Thomas, graciously donated by Carl Williams ‘02, dinner with Professor Richard J. Conviser, and a lunch with 7th Circuit Judge, the Honorable Ilana Diamond Rovner ‘66. If you or your firm is interested in getting involved in the 2008 KJF Spring Auction, please contact the Foundation’s President, Jill Roberts at jroberts@kentlaw.edu. 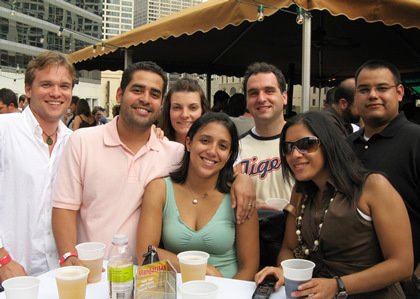 Over 200 guests from the Class of 2007 and their friends gathered at Rock Bottom Brewery’s rooftop beer garden on July 26, 2007 to celebrate their completion of the Illinois State Bar Exam. Guests enjoyed views of River North while catching up with their classmates. Dean Hal Krent congratulated the newest Kent Alumni and drew for raffle prizes of Kent-themed items. Each year Chicago-Kent alumni come together to honor distinguished alumni and individuals who serve Chicago-Kent and the legal community. 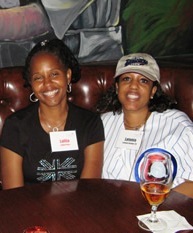 The 30th annual Alumni Luncheon is scheduled for December 5, 2007 at the Standard Club in Chicago. This year’s luncheon is especially poignant as we bid farewell to retiring IIT President Lew Collens, former Dean of Chicago-Kent from 1974 to 1990. Details and sponsorship opportunities will be posted online soon. 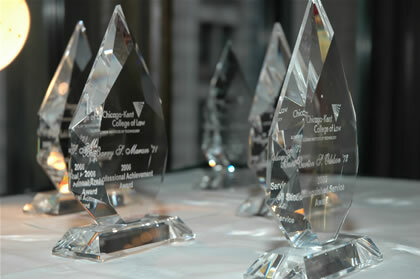 Please click here to make your nominations online for deserving alumni or outstanding members of the legal community no later than August 31, 2007, or call the Office of Alumni Relations at 312-906-5240 to have a nomination form faxed or mailed to you. Invitations will follow in the fall. Please SAVE the DATE for Your Chicago-Kent Reunion! All events will take place in the evening. For more information, please visit the Reunion Portal. If you are interested in volunteering for Reunion please contact the Office of Alumni Relations at (312) 906-5240 or alums@kentlaw.edu. The Chicago-Kent College of Law Program in Intellectual Property Law, Chicago Intellectual Property Alliance and the World Intellectual Property Organization will co-sponsor this conference on pending and emerging issues surrounding the administration of the Patent Cooperation Treaty (PCT), its rules and regulations, and the related Authorities. A panel will present a hypothetical and lead a discussion with the audience about ethics issues that may be encountered when working through a PCT application. Cost: $125 per person. This program provides 3.0 hours of CLE credit including 1.0 hour of ethics credit. For more information and to register, please visit www.kentlaw.edu/depts/cle. The Roundtable, composed of former law clerks at the Federal Circuit, will address this year's topic, "MedImmune and SanDisk: Seeking a License Without Getting a Lawsuit." The scheduled participants are Meredith Martin Addy, Brinks Hofer Gilson & Lione, Michelle Armond, Marshall, Gerstein & Borun LLP, Leonard D. Conapinski, McDermott Will & Emery LLP, Laura L. Donoghue, Sidley Austin LLP, Laura A. Lydigsen, Brinks Hofer Gilson & Lione, Sasha D. Mayergoyz, Latham & Watkins LLP, David C. McKone, Latham & Watkins, LLP, and Lisa Schneider, Sidley Austin LLP. Attendees are eligible to receive 1.0 hour of IL MCLE credit. There is no charge or registration required for this event. Please Note: This event has been rescheduled for March 2008. Please visit www.kentlaw.edu/depts/cle for updated information.